Position Summary: This position recruits and trains volunteers, develops and coordinates evening Mele programs, and provides backup for all other public programs including site and school tours. Recruits and trains volunteers and interns to support various staffing needs of the HMH. Seeks requests from staff for interns or volunteers for special events, other projects and general staff assistance. Develops recruitment materials for a variety of media and collaborates with the Communications Specialist to place the materials. Follows-up, screens and interviews all volunteer or intern leads. Conducts general volunteer training; revises volunteer training manual as needed. Schedules volunteers and tracks hours. Plans and conducts volunteer recognition programs. Schedules docents as needed and periodically leads site tours. Oversees development of and coordinates evening Mele programs and assists with all other public programs. Coordinates all planning for evening Mele programs and other events as requested. Oversees staff, volunteers, and contractors for Mele programs. Provides assistance and supervision for other programs including daily and school tours as requested. Obtains liquor licenses for all HMH events. Assists with grant writing and fundraising for programs. Represents HMH to the community and profession as appropriate. Establishes and nurtures a network of relationships with educators, program managers, and community organizations to ensure thoughtful and well-attended programs. Demonstrates continuous effort to improve operations and work cooperatively to provide the best possible experience for the visitors. Cheerfully performs other duties as assigned. B.A. in Museum Studies, History, American Studies, Hawaiian Studies, Pacific Island Studies, or Anthropology from an accredited college or university preferred. Knowledge of current historic preservation, and interpretation principles and practices. Ability to network effectively to recruit volunteers and interns. Ability to participate in multiple projects and demands simultaneously. Strong interpersonal skills, ability to develop relationships and communicate with the public and management. Working knowledge of Microsoft Office software, including Word, Excel, and PowerPoint. Flexibility to work Tuesday – Saturday including occasional evenings. Ability to lift fifty pounds and supervise program set-up. 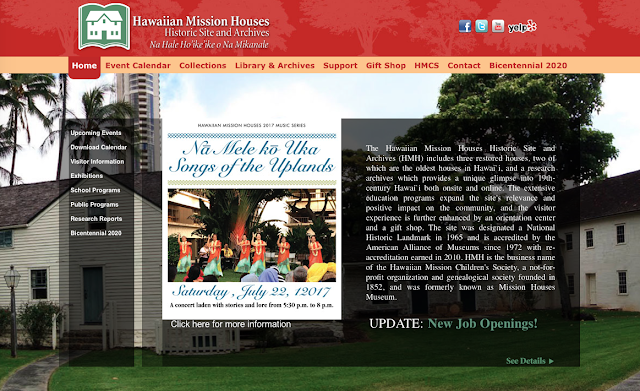 Hawaiian Mission Houses is centrally located in downtown Honolulu and is designated as a National Historic Landmark. The one-acre campus includes the two oldest houses in the State of Hawaii and the largest collection of Hawaiian language books in the world. It also includes the research archives, visitor center, and store. Mission: Hawaiian Mission Houses Historic Site and Archives preserves the heritage and interprets the stories of the American Protestant Missionaries, their descendants, and their relationships with the people and cultures of Hawai`i, connecting with contemporary life, and encouraging a deeper understanding and appreciation for the complex history of Hawai`i. To apply for this position, please e-mail cover letter and résumé, and two brief writing samples to lsolomine@missionhouses.org indicating “Volunteer and Program Coordinator Position” on subject line. Or send your application to: Hawaiian Mission Houses, 553 South King St., Honolulu, HI 96813-3002, Attn: Volunteer and Program Coordinator Position. FAX: 808-545-2280.